changed home entertainment forever. Around this time, Charles and his team were developing a plan to maximize the power of the La-Z-Boy name at retail. Soon, La-Z-Boy Showcase Shoppes were springing up across the country. 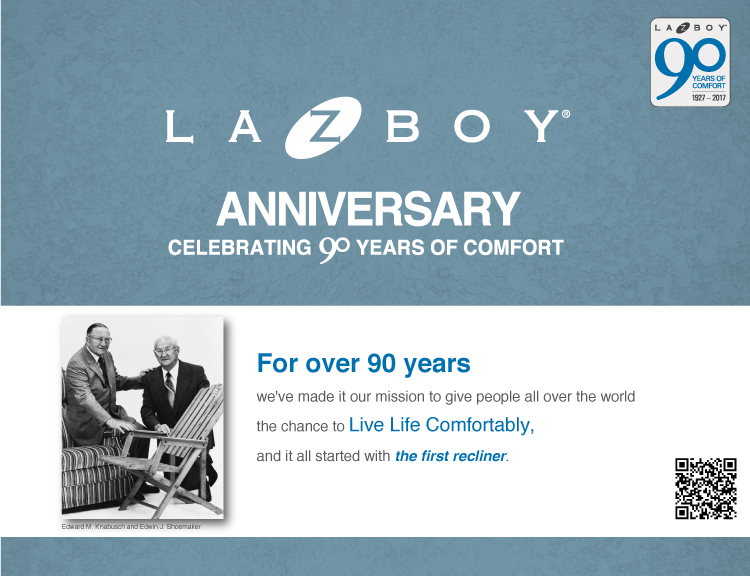 These freestanding, independently owned, exclusively La-Z-Boy stores were designed as retail destinations for consumers seeking genuine La-Z-Boy comfort and quality. The company invested heavily in advertising and La-Z-Boy quickly became the most recognized name in furniture. "Everybody loves a winner" was one of many sports-related slogans used by La-Z-Boy during the 1970s and 1980s. Featuring well-known football stars such as Joe Namath, Don Shula and Alex Karras, La-Z-Boy gave birth to the armchair quarterback. Throughout this period, La-Z-Boy also was endorsed by a variety of other memorable spokespeople, including Uncle Sam, Johnny Carson, Ed McMahon and Jim Backus. In fact, Backus and his alias Mr. Magoo recorded more than 15,000 radio and TV commercials for La-Z-Boy, earning a spot in the Guinness Book of World Records.